Computers | Break It And Learn! Meet Gus, My Canon MP530 Printer! Hello, everyone! I’d like you to meet Gus, my Canon MP530 printer! 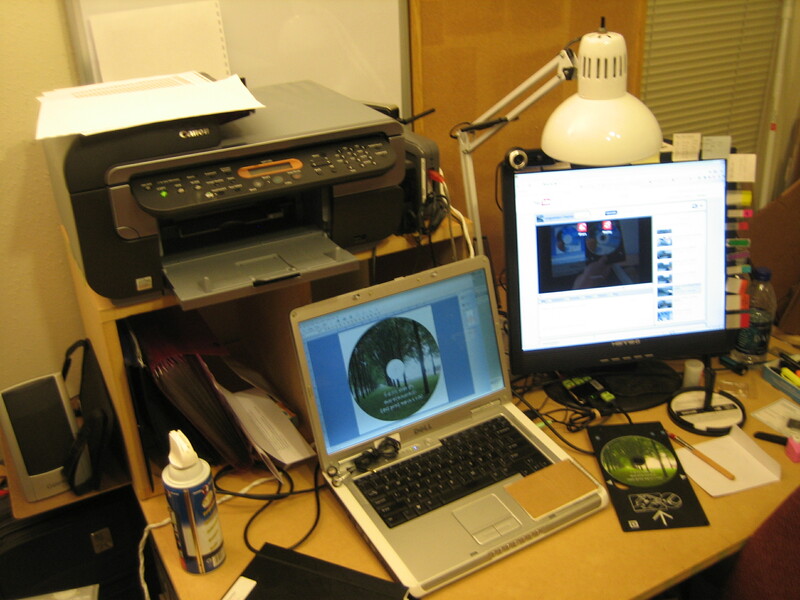 My old Epson C80 got clogged again after a while, and Gus is its replacement! 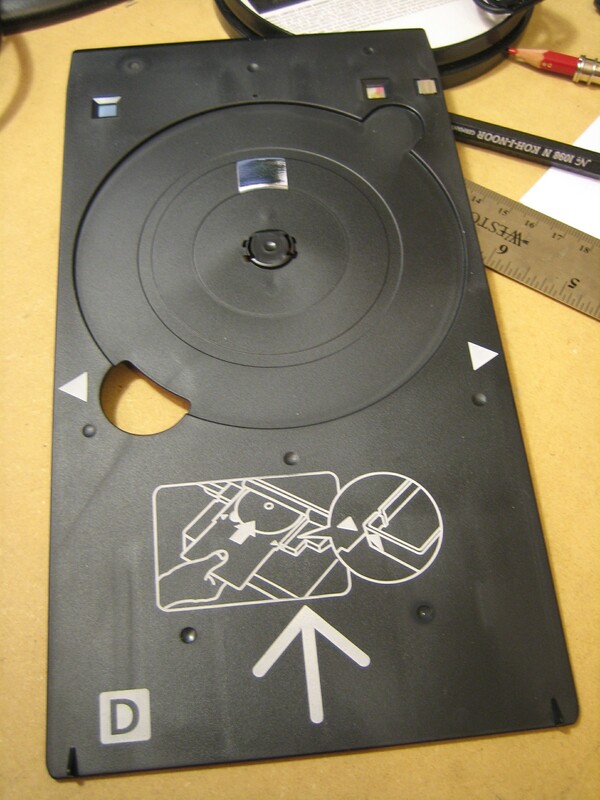 I got a new toy today — a CD/DVD tray for my printer which allows me to print on CD’s and DVD’s! Apparently this feature was disabled on the Canon MP530’s made for the U.S. market but it can be enabled with MANY pushes of a few buttons. (Can you do the hokey pokey??? Links to instructions at the end of this post.) Why spend potentially hundreds of dollars on a new CD/DVD printer when I only need to spend $18.99 to upgrade a printer I already have? Not bad… It’s not as crisp and clear as I would like it to be, and it’s definitely not “professional” quality, but I’m still very happy with it. Good enough for me! And besides, this was only my first test print. The not-so-great resolution might be a result of the poor quality of this particular CD’s printing surface. Yes, yes, forgive my nasty habit of dating things I open or install… $27.94 for the 5 bottles of ink above… I opened the first bottle more than a year ago and still have half of the ink left! 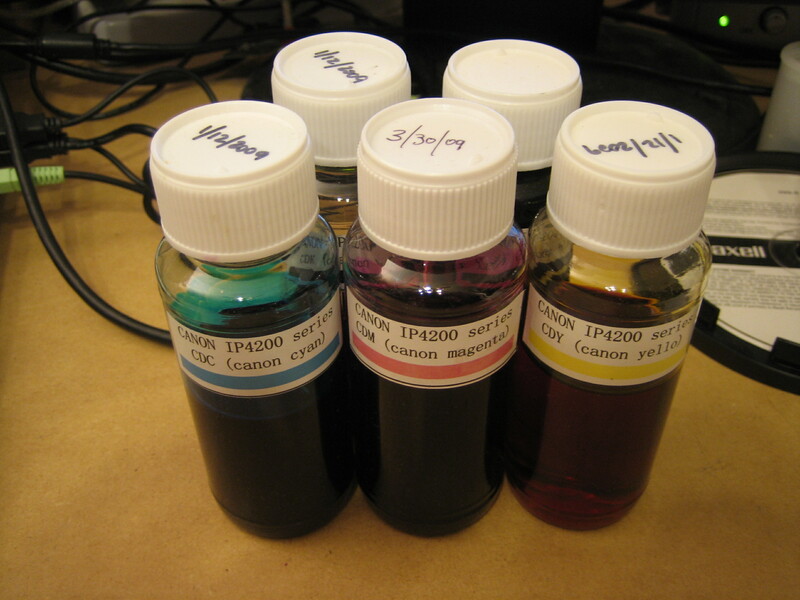 And unlike with the Epsons, you don’t have to hassle with chip resets or freezing the ink counter. “eBay ink?” you ask? Yes, eBay ink. $30 for 2 years’ worth of ink? Versus $30 for just ONE ink cartridge that only lasts 3 months? Yes, eBay ink, please! 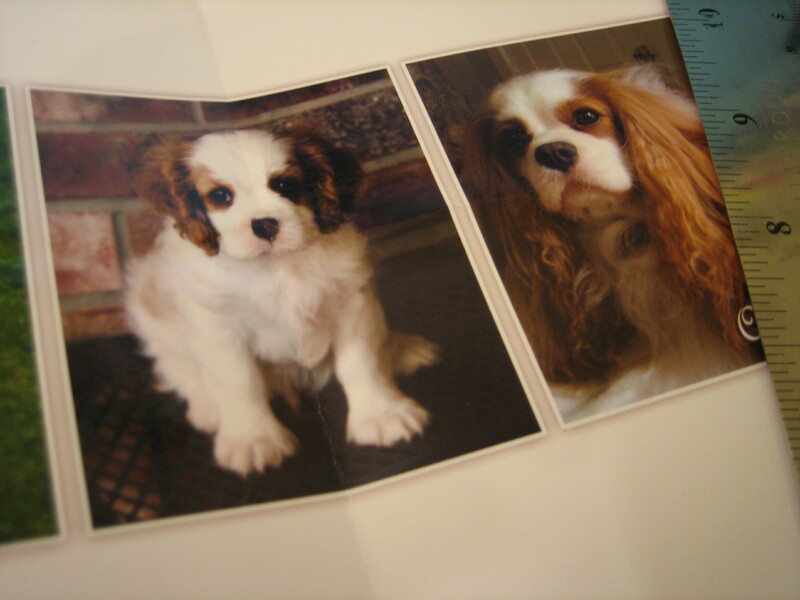 My eBay ink actually produces almost-photo quality prints as shown in this photo of a photo! 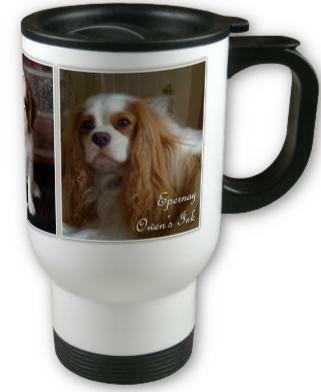 I wanted to design a mug for my friend Leigh, but I wanted it to be a surprise, so I grabbed the images of her beautiful pup Owen from her Facebook page. Of course, trying to print something of any decent quality from 72 dpi web jpgs is a HUGE no-no, but I didn’t want to ruin the surprise! So, I did a test print of the image before I sent my design to the fantastic website, Zazzle, and hot dog, it looked crisp and clear! 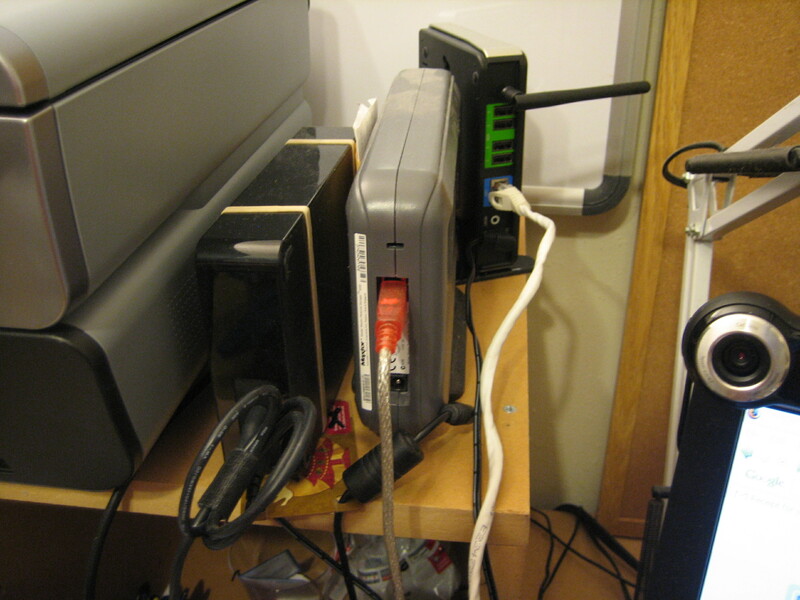 Yes, the MP530 is a great printer, but it is not network-ready, so my next task is to get my wireless print server (in the back) working. And guess what? It’s ANOTHER eBay purchase. I love eBay. The print server was half-configured before I crazily started punching buttons on my printer (see video at the end of this post). 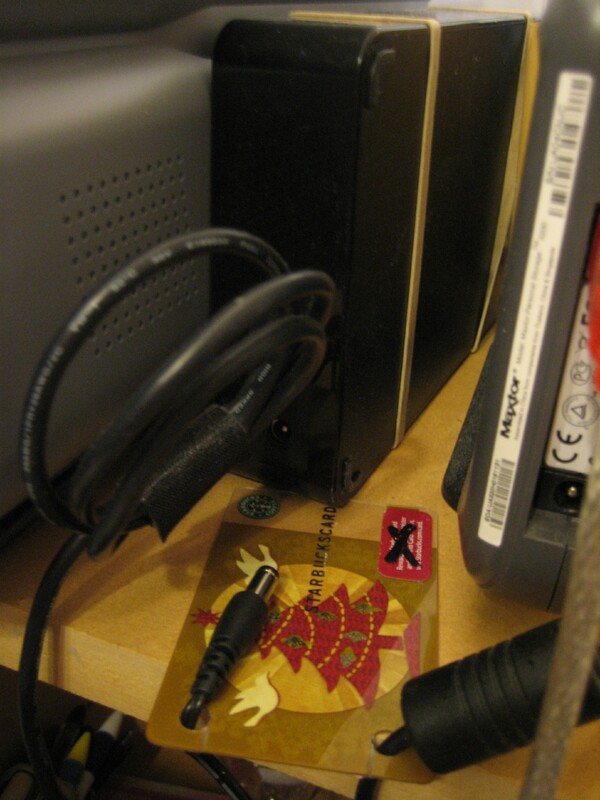 But for right now, he’s keeping Rolf, my Western Digital hard drive, and Max, my Maxtor hard drive, company. Poor Max. He’s had several identity crises. He used to be named George, but then Rolf came along, and he insisted on being called Georg. But then his owner kept forgetting his name, so he gave up, and gave into answering to the name Max. Since the archival properties of the printer ink is highly suspect (most likely deteriorating DVD’s and paper over time), Rolf and Max are invaluable. I kept having to search for the ends of the cords for Rolf and Max until I made this. And lastly, meet Hermie, my laptop! He’s slogging along, good ol’ boy that he is! Although his owner is quite egotistical. The unforeseen consequence of this has been that people borrowing Hermie have had a hard time trying to type their passwords! Is this worse than Jane putting her mouse on the left? Why does that also throw people off? But wait! We mustn’t forget Jack and Q! (I’m not sure Q’s name is sticking yet… It’s supposed to be short for Q*bert… I think…) Jack, the Nokia, and Hermie got along very very well! They were always gossiping about people in Jane’s contact lists and discussing things on her calendars whenever they got within range of each other. And Jane would always hear them beeping excitedly whenever they were joyfully roughhousing with each other. Boys will be boys! But now, Q, the LG… He’s a recalcitrant one, refusing to get along with Hermie the way that Jack so easily got along with him! Jane jumped onto the Sprint family bandwagon, and abandoned poor little Jack as an orphan… Jack, you weren’t very showy, but Momma misses you!!! And if you’ve noticed a trend, no, Jane doesn’t seem to have any female gadgets. Only the gadget master is female! 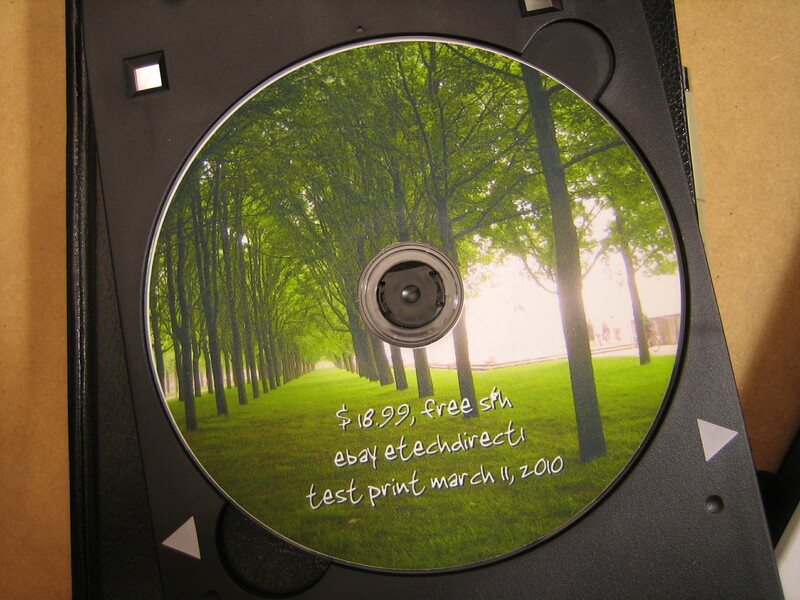 I almost forgot to include links for how to enable your Canon MP530 to print on CD’s! These aren’t my videos, but they are fantastic, despite the few typos! Erg… Can never do anything on this WordPress.com site… Ah well. I haven’t been in a blogging mood lately. No particular reason. No, it wasn’t because I wanted to keep my photos in the forefront; I’m not THAT vain! I’m cleaning out my inboxes, and I’m finally reading my Dec 2008 issue of Sightseer, the monthly newsletter for Google Earth. And… Enough rambling for the month. 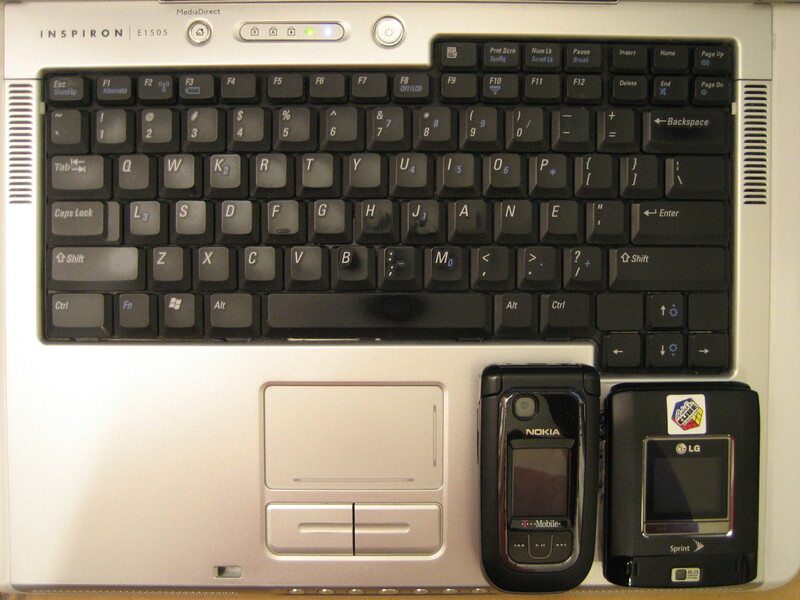 Testing BlogDesk. Ignore this entry. Mary had a little Tiggy lamb. Random 360×360 pixel image from my computer. “Paper tear” border – will prob be overridden by WP CSS. TESTING BLOCK QUOTE, highlighting, and font color HERE. Auto-sized for blog. No enlarged version. 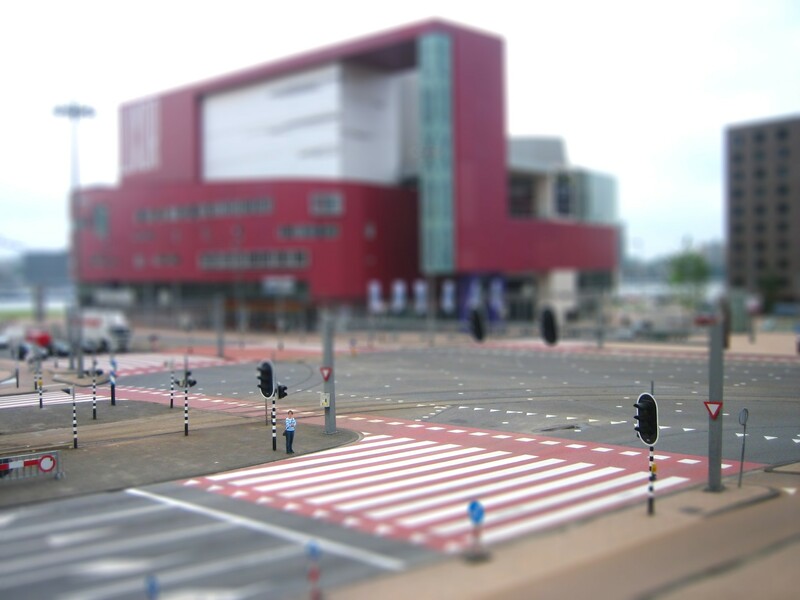 450 pixels wide. 500 pixels wide: Will WP crop sides? Link to more interesting signs. NOTE: Can I directly edit HTML code via BlogDesk??? Flickr Downloader is a great utility. It’s small (~250 kb) and simple, yet very powerful – the best traits in software! It can download ALL photos in a Flickr album at ORIGINAL resolution with ONE CLICK! I’ve always wondered why Flickr never had that option – and that’s one of the main reasons that I uploaded my photos to Google’s Picasa instead of Flickr. (Not that I would have a need to download pictures I uploaded – unless, knock on wood, my computer AND my backup drive both crash!) The other reason I chose Picasa was that it allowed me to geotag my photos. This online album allows me to relive a trip that my friends and I took through East Texas in our rented Prius in 2005! After a few years of using Picasa, Flickr still seems to be hugely dominant, so with this Flickr Downloader program, I MIGHT become a convert… Except… How can I abandon Google??? 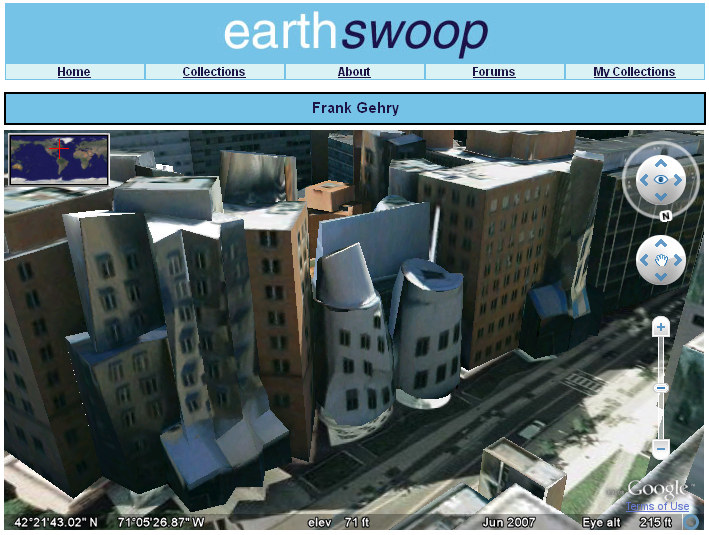 I love Google… GoogleEarth, GoogleMaps, Google Reader, Sketchup (never thought I’d say I loved this program)… And I’m starting to like GMail and Google Documents… But most of all, I love the mashup and collaboration POTENTIAL of their products. But download Flickr Downloader and YOU, my fellow Google Groupie, can coexist with the Flickr Fanatics. But Google is still better! EXCEPT: Overall, WordPress is better than Blogger!